Offsite construction is shaping the market and many see it as the solution to meeting the UK’s demand for school places. There are sceptics however, preferring traditional builds, so I wanted to talk about the benefits of pre-designed modular construction from an architect’s perspective. Being able to cost components up front and provide cost certainty is a huge plus when trying to meet tight budget constraints. There is also the obvious programme benefit of being able to submit planning applications within just a few weeks of the first engagement meeting with the client. With modular we can maximise design time to ensure site issues are resolved correctly and economically. Which in turn allows for an early design freeze and, with this, comes the ability to talk about the tactile nature of the school sooner. 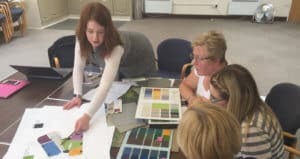 Our clients are choosing colours and interior finishes after one or two engagement meetings. Choosing colours and materials after the first engagement meeting. 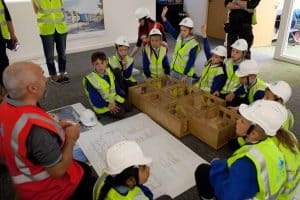 Modular builds also make pupil engagement tangible and fun with the opportunity for children to visit the offsite factory and touch and feel their facility within a danger-free and controlled environment. They can jump up and down on the concrete floors and feel how robust the buildings are as their classrooms are being put together. Pupils visiting an offsite factory to experience their new learning facility. It’s not just classrooms that can be built offsite. 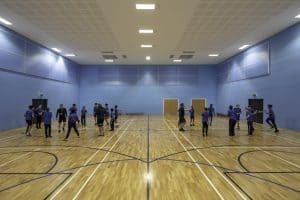 Sport England compliant sports halls can be constructed in modular. The hall in the picture below, along with its associated changing rooms, was completed from start to finish in under six weeks on site. Sport England compliant hall – delivered in under six weeks. Offsite construction is the perfect solution to minimising disruption to a live school site as there is no need for ‘programme hungry’ wet trades and the storage of materials on site. The modules can be delivered outside school hours so the day to day operation of a school can continue, uninterrupted. Modules are craned in after school hours. Some are turned off by the pre-conceived idea that modular design means boxes, those temporary classrooms of old. But the external appearance of modular school buildings can now be enhanced dramatically without any uplift in cost with the use of cladding systems being offered as cost-neutral options, due to the saving in programme compared to materials applied on site. Buildings that are constructed offsite nowadays feel permanent, with their concrete floors and solid structures. You can’t tell the difference between a modular, offsite-constructed building and a traditionaly built one as they are traditionally built – just offsite! 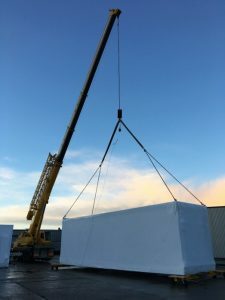 At Lungfish, we’ve embraced the use of modular due to the benefits it brings to both design and construction, and we will continue to be an advocate for this industry.